Launched in May 2015 at the Sunreef Yachts shipyard in Gdansk – Poland Blue Belly is now opening her interiors to the public. Being the 12th unit from the timeless 70 Sunreef Power line introduced and designed by famous sailor Laurent Bourgnon in 2008, Blue Belly is the first build 70 ft power catamaran from Sunreef with a fully open saloon. The idea of having a 70 Sunreef Power by the Owners came in 2014, straight after the launch of their first yacht - 60 Sunreef Power Ocean`s 11. The stunning 60 footer unleashed desires of owning a yacht of a bigger size and with an appreciation for luxury design and for spending indulgent time aboard, the 70 ft catamaran seemed to be the best option for such discerning clients. Blue Belly is definitely one of those boats which makes neighbors at the dock a bit envious. 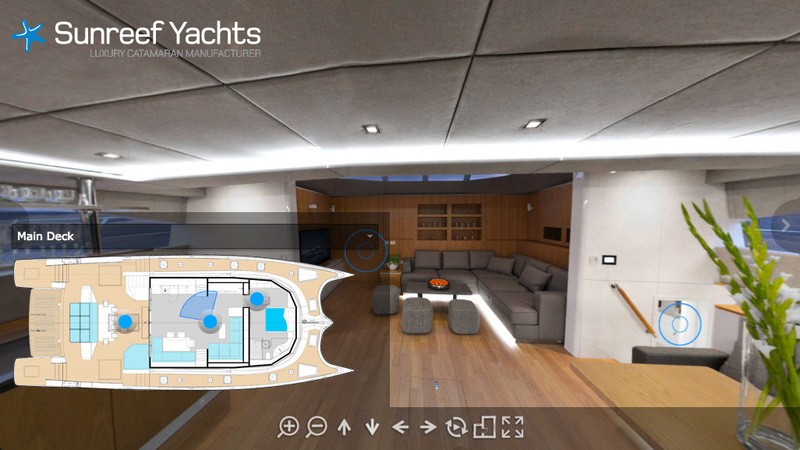 Knowing the client`s needs, Sunreef Yachts designers opened the living area on the main deck and eliminated the interior navigation station in the saloon. In this way, an incredible amount of living space combined with the lounging and dining area was achieved. As Blue Belly is dedicated to short cruises, the yacht is equipped in the exterior helm station on the flybridge. Straight from the saloon is direct access to the master suite located at the front of the yacht. Following her predecessor 1 Life, launched in 2014, Blue Belly`s master cabin features panoramic views and has a spectacular magic glass panel separating the his and hers bathroom from the sleeping area. The array of colors chosen for Blue Belly`s upholstery comprises a variety of pale browns and greys, inspired by the warm rich tones of the desert sands and rocks, accompanied by navy blue and white nautical elements. This palette combination gives a special beach house effect and exquisite look to the space. Interior designer – Orna Weitz from BROSH ALON design office – carefully chose the perfect assortment of fabrics, predominantly flax and Italian leather with ideal textures that perfectly emulate the ultimate luxury summer apartment. All cabins are touched with oak veneer and corian surfaces. Through intense study of the owners’ preferences the designer has achieved an ideal place to live and spend time mixed with natural and luxury finishes. Blue Belly can easily accommodate in the comfortable conditions up to 10 guests in 2 VIP cabins and 1 standard cabin and a master suite. The galley down with the separate exit from the aft is located in the portside hull. Each cabin has its own bathroom and storage space. Crew cabins are located in the forepeaks. The layout of the yacht was prepared to secure the Owners a maximum of privacy and separate quarters from the crew. Similarly to 1 Life, Blue Belly is equipped with a hydraulic platform placed at the aft. The lowering function ensures direct and easy launching of the jet ski into the water. The cockpit and the flybridge comprise sunbathing mattresses, adjustable tables and a grill to make spending time aboard an even bigger pleasure.